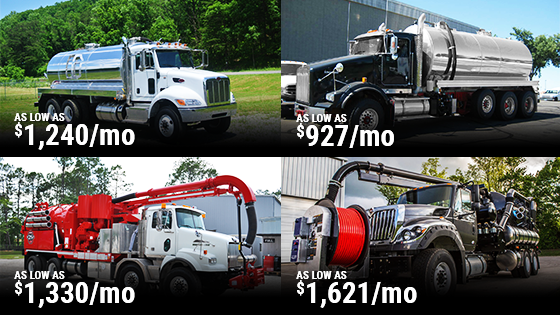 Wastewater and septic pumper equipment at low monthly payments! Expert financing consultants are standing by to help you get the septic pumper truck or portable restroom your wastewater management business needs. Whether it’s a truck you just saw on Pumper.com or something else entirely, you can get it with a flexible plan and low monthly payments. Fill out this short form to get started on financing your next septic pumper truck or portable restroom today! *Prices shown are examples and do not represent the equipment pictured. Our calculators do not represent an approval or exact loan amount. A financing decision, the amount of the loan, and the monthly payment will be dependent upon Beacon Funding’s assessment of your business and a variety of credit criteria including: time in business, personal and business credit history, transaction size, amount of down payment, type and age of equipment, and special financing offers. © Beacon Funding Corporation. All Rights Reserved.